The hardware is made to be accessible and has a strong element of “what you see is what you get.” The distance sensors are on small breakout boards, and the board turns the sensor disk via a DC motor and 3D printed belt drive. Even the method of encoding the disk’s movement and zero position has the same WYSIWYG straightforwardness: a spring contact and an interrupted bare copper trace on the bottom of the sensor disk acts as a physical switch. In fact, exposed copper traces in concentric circular patterns and spring pins taken from an SD card socket are what provide power and communications as the disk turns. The prototype looks good and sounds like it should work, but how well does it hold up? We’ll find out once [JRodrigo] does some testing. Until then, the board designs are available on the project’s GitHub repository if anyone wants to take a shot at their own approach without starting from scratch. For their final project in embedded microcontroller class, [Aaheli, Jun, and Naomi] turned their focus toward assistive technology and created an Electronic Travel Aid (ETA) for the visually impaired that uses haptic feedback to report the presence of obstacles. We have seen a few of these types of devices in the past, and they almost always use ultrasonic sensors to gauge distance. Not so with this ETA; it uses six VL53L0X time-of-flight (ToF) sensors mounted at slightly different angles from each other, which provides a wide sensing map. It is capable of detecting objects in a one-meter-wide swath at a range of one meter from the sensors. The device consists of two parts, a wayfinding wand and a feedback module. The six ToF sensors are strapped across the end of a flashlight body and wired to an Arduino Mini inside the body. The Mini receives the sensor data over UART and sends it to the requisite PIC32, which is attached to a sleeve on the user’s forearm. The PIC decodes these UART signals into PWM and lights up six corresponding vibrating disc motors that dangle from the sleeve and form a sensory cuff bracelet around the upper forearm. We like the use of ToF over ultrasonic for wayfinding. Whether ToF is faster or not, the footprint is much smaller, so its more practical for discreet assistive wearables. Plus, you know, lasers. You can see how well it works in the demo video after the break. This device is intended to augment the traditional white cane, not replace it. This virtual cane we saw a few years ago is another story. Measuring air flow in an HVAC duct can be a tricky business. Paddle wheel and turbine flow meters introduce not only resistance but maintenance issue due to accumulated dust and debris. Being able to measure ducted airflow cheaply and non-intrusively, like with this ultrasonic flow meter, could be a big deal for DIY projects and the trades in general. The principle behind the sensor [ItMightBeWorse] is working on is nothing new. He discovered a paper from 2015 that describes the method that measures the change in time-of-flight of an ultrasonic pulse across a moving stream of air in a duct. It’s another one of those “Why didn’t I think of that?” things that makes perfect sense in theory, but takes some engineering to turn into a functional sensor. [ItMightBeWorse] is using readily available HC-SR04 sensor boards and has already done a proof-of-concept build. He’s getting real numbers back and getting close to a sensor that will go into an HVAC automation project. The video below shows his progress to date and hints at a follow-up video with more results soon. Here’s wishing [ItMightBeWorse] the best of luck with his build. But if things go sideways, he might look to our post-mortem of a failed magnetic flow meter for inspiration. Pour yourself a nice hot cup of tea, because [iliasam]’s latest work on a laser rangefinder (in Russian, translated here) is a long and interesting read. The shorter version is that he got his hands on a broken laser security scanner, nearly completely reverse-engineered it, got it working again, put it on a Roomba that was able to map out his apartment, and then re-designed it to become a tripod-mounted, full-room 3D scanner. Wow. The scanner in question has a spinning mirror and a laser time-of-flight ranger, and is designed to shut down machinery when people enter a “no-go” region. As built, it returns ranges along a horizontal plane — it’s a 2D scanner. 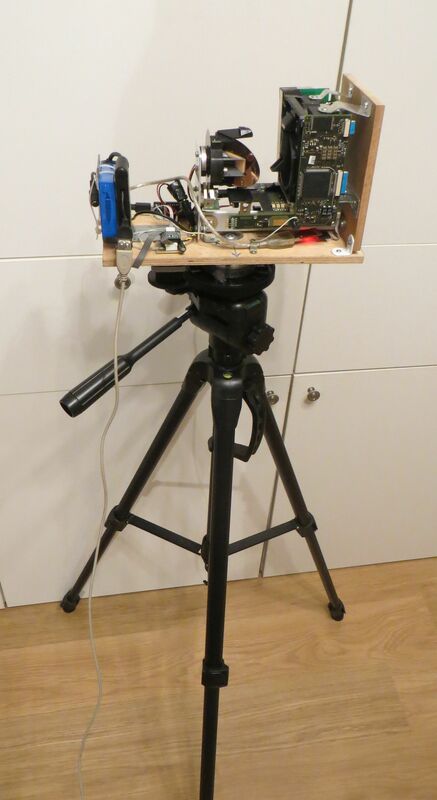 The conversion to a 3D scanner meant adding another axis, and to do this with sufficient precision required flipping the rig on its side, salvaging the fantastic bearings from a VHS machine, and driving it all with the surprisingly common A4988 stepper driver and an Arduino. A program on a PC reads in the data, and the stepper moves another 0.36 degrees. The results speak for themselves. This isn’t [iliasam]’s first laser-rangefinder project, naturally. We’ve previously featured his homemade parallax-based ranger for use on a mobile robot, which is equally impressive. What amazes us most about these builds is the near-professional quality of the results pulled off on a shoestring budget. Every robotics project out there, it seems, needs a way to detect if it’s smashing into a wall repeatedly, acting like the brainless automaton it actually is. The Roomba has wall sensors, just about every robot kit has some way of detecting obstacles its running into, and for ‘wall-following robots’, detecting objects is all they do. While the earliest of these robots used a piece of wire and a metal contact to act like a switch for these object detectors, ultrasonic sensors – the kind you can buy on eBay for a few bucks – have replaced this clever wire spring switch. Now there’s a new sensor for the same job – the VL6180 – and it measures the speed of light. This is not the first Time of Flight distance sensor on the market; earlier this week we saw a project use a sensor called the TeraRanger One. This sensor costs €150.00. The VL6180 sensor costs about $6 in quantity one from the usual suspects, and breakout boards with the proper level converters and regulators can be found for about $25. More expensive sensors have a greater range, naturally; the VL6180 is limited to somewhere between 10cm (on paper) and 25cm (in practice). But this is cheap, and it measures the time of flight of pulses of light. That’s just cool. Here is a two-part Navy training film from 1953 that describes the inner workings of mechanical fire control computers. It covers seven mechanisms: shafts, gears, cams, differentials, component solvers, integrators, and multipliers, and does so in the well-executed fashion typical of the era. Fire control systems depend on many factors that occur simultaneously, not the least of which are own ship’s speed and course, distance to a target, bearing, the target’s speed and course if not stationary, initial shell velocity, and wind speed and direction. The mechanisms are introduced with a rack and pinion demonstration in two dimensions. Principally speaking, a shaft carries a value based on revolutions. From this, a system can be geared at different ratios. Cams take this idea further, transferring a regular motion such as rotation to an irregular motion. They do so using a working surface as input and a follower as output. We are shown how cams change rotary motion to linear motion. While the simplest example is limited to a single revolution, additional revolutions can be obtained by extending the working surface. This is usually done with a ball in a groove. [Matthias] recently published a paper he worked on, in which he details how his group managed to reconstruct a hidden scene using a wall as a mirror in a reasonably priced manner. A modified time-of-flight camera (PMD CamBoard Nano) was used to precisely know when short bursts of light were coming back to its sensor. In the picture shown above the blue represents the camera’s field of view. 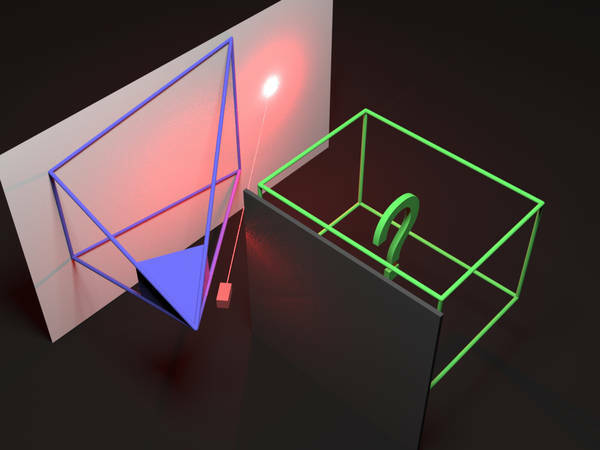 The green box is the 1.5m*1.5m*2.0m scene of interest and we’re quite sure you already know that the source of illumination, a laser, is shown in red. As you can guess, the main challenge in this experience was to figure out where the three-times reflected light hitting camera was coming from. As the laser needed to be synchronized with the camera’s exposure cycle it is very interesting to note that part of the challenge was to crack the latter open to sniff the correct signals. Illumination conditions have limited impact on their achieved tolerance of +-15cm.